The root of Pulsatilla chinensis (Bge.) Regel of family Ranunculaceae. Mainly in northeast areas, and Hebei, Shaanxi provinces of China. Light smell and slightly bitter and astringent taste. Thick and long root in regularity, grayish yellow of superficial, white villus at the top of root. 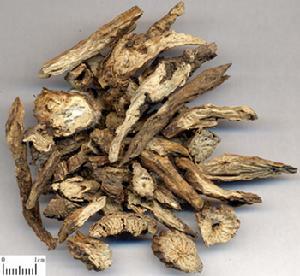 Bitter, cold; large intestine, liver and stomach meridians entered. Clear heat and remove toxicity, cool blood and check dysentery. It excels in eliminating damp-heat from stomach and intestines and clearing heat-toxicity in blood system, and is effective in treating dysentery due to damp-heat or dysentery with blood due to heat-toxicity, so it is regarded as a good herb for treating dysentery. 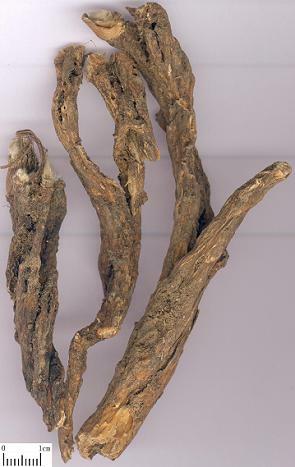 For dysentery due to damp-heat, dysentery due to heat-toxicity, tenesmus and dysentery with bloody pus, it is often combined with heat-clearing, dampness-drying, and dysentery-checking herbs, such as Huang Lian, Huang Bai and Qing Pi, as in Bai Tou Weng Tang from Shang Han Lun. For paroxysmal dysentery with blood, abdominal pain and diarrhea, stool with blood in dark red or purplish red color, or bright red blood within white mucus, paroxysmal onset, difficult healing for a long time which is called recurrent dysentery or amebic dysentery, it can be decocted alone for oral taking or be applied by retention enema, and can also be combined with E Jiao and Chi Shi Zhi, etc. With the actions of clearing heat and removing toxicity, it is also used to treat heat-toxicity syndrome such as sores, abscess, and hemorrhoids with swelling pain, etc. It is effective when the pounded products being taken orally or applied topically. It is often combined with heat-clearing and toxicity-removing, abscess-curing and nodulation-dissipating herbs so as to mutually take effect of clearing heat, cooling blood and relieving swelling such as Pu Gong Ying and Lian Qiao, etc. In addition, it also has actions of killing worms and checking malaria, and can be used to treat pruritus vulvae, leucorrhoea seen in trichomoniasis vaginitis and malaria. For pruritus vulvae and leucorrhoea, it can be used alone or combined together with Ku Shen and Bai Bu, etc. for vaginal douche in decoction. For malaria, it is combined with Huang Qin and Chai Hu, etc. Decoct 9~15g. 15～30g for treating amebic dysentery, seven days make one course; when using the fresh one, decoct 15~30g. Proper dosage is for topical applying; 30～100 g used in retention enema.